Arturo J. Aballí, Jr. is a top, multilingual, international tax, trust and estate planning specialist, and counselor to many of the world’s wealthiest families. 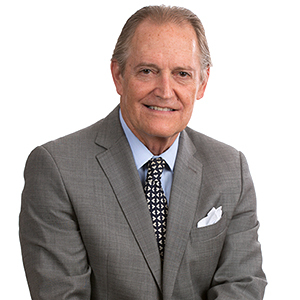 With over 40 years of experience in global wealth management and international transactions, he is among the tiny group of international practitioners who are Board-Certified in International Law by The Florida Bar. He trained in New York and Spain and practiced at the New York Bar for many years before moving to Florida, and subsequently founding AMK in Miami in 1993. He is a member of the Bar of the U.S. Court of International Trade, a frequent author and lecturer on hot topics in international taxation, and is peer-reviewed as “AV” by the U.S.A’s premier rating organization, Martindale-Hubbel, denoting the highest possible level of skill and ethics. Mr. Aballí was born in Havana, Cuba, to a prominent medical family. His father and grand-father were world-renowned pediatricians in the forefront of academic medicine. Many hospitals, including the University of Havana Medical School, were named after his grandfather. Mr. Aballí came to the U.S. in his teens as a consequence of the turmoil following the Cuban revolution. Although his native language was Spanish, he swiftly acquired complete fluency and literacy in English and graduated from Duke University with a Bachelor of Arts degree in 1965. Breaking with the family tradition, Mr. Aballí chose the law instead of medicine, and was awarded a Juris Doctor degree by the New York University School of Law in 1968. There he won the prestigious NYU-Ford Foundation Civil Law Program Scholarship and, as a consequence, he had the opportunity to study civil law at the University of Madrid, School of Law, in Spain. While studying in Madrid, he obtained practical experience in Spanish and comparative law through exposure to the international clients of Bufete Vega Penichet. In late 1969, Mr. Aballí returned to New York, where he was admitted to the bar and joined Shearman & Sterling – long-regarded as part of the small group of elite American “white shoe” law firms. As an associate rotating through the firm’s various departments he gained exposure to the corporate and tax aspects of the representation of North America’s largest multinational firms. After leaving Shearman & Sterling, he concentrated in the representation of foreign investors and U.S. based entrepreneurs doing business abroad with an emphasis on international taxation, and, still based in New York, helped found a small international law boutique which merged into much larger, Boston-based Gadsby & Hannah in 1982. By the mid-‘80s, the epicenter of Latin American investment in the United States was increasingly shifting to Miami, as Florida began its population explosion. (It is now the third most populous U.S. State, having overtaken New York, and lagging behind only California and Texas). Miami was an increasingly attractive city for any North American lawyer focusing on international legal representation and particularly on servicing the wealth management needs of a Latin American client base. Seeing the growing demand and opportunity, Mr. Aballí and his Peruvian wife, Patsy, moved to Miami where, in 1987, Mr. Aballi joined the international law firm of Squire, Sanders & Dempsey (now Squire Patton Boggs) as a partner in the Miami office, where he helped expand the firm’s Latin American practice. After another six years in the big firm environment, Mr. Aballí decided to return to a specialist boutique practice. In 1993, together with his Squire colleagues, Henk Milne and Craig Kalil, he established AMK: an international law boutique, focusing on international tax, trusts, estate planning, and international dispute resolution. Over the past 22 years at AMK, Mr. Aballí has helped build a close-knit team of like-minded, multi-lingual, multi-cultural, international lawyers, who have developed strong working relationships with a network of similar specialists across the globe. Over his legal career, to date spanning more than 40 years, Mr. Aballi has gained a vast depth of experience in all aspects of global wealth management. While clients seek his advice from all over the world, his particular focus has been on the representation of U.S.-based foreign clients in their international business and investment transactions. In terms of disciplines, this practice is concentrated in international tax, trusts, corporations, and estate planning for high-net-worth families and individuals; international financial transactions; cross-border corporate acquisitions; and international license agreements. In this last category, with the growth of the Latin entertainment industry in Miami, he has had increasing involvement in the legal representation of Latin American TV stations, independent TV producers, and authors. Mr. Aballí has been a frequent speaker at international seminars on hot topics including tax planning, international contracts, exchange of information treaties, and asset protection structures. He has served as a director of the Colombian and Spanish Chambers of Commerce, and the Florida International Banking Advisory Council to the Florida State Banking Department. He is a member of the American Bar Association (Committee of U.S. Activities of Foreigners, Tax Section, and International Law Section); The Florida Bar (International Section, Tax Section, and Foreign Tax Committee); the Cuban American Bar Association; the Estate Planning Council of Greater Miami; and the London-based Society of Estate and Trust Practitioners (STEP), (Miami Chapter). Co-presenter, “Onshoring – Bringing the Assets of a Foreign Person to her U.S. Beneficiaries,”International Law Section of The Florida Bar and The Northern Trust Company, Miami, Florida, September 19, 2013. Speaker, “Bringing it to Uncle Sam: Some Aspects of Succession from Foreign Investors to U.S. Beneficiaries,”Transnational Tax Network Seminar, Miami, Florida, May 3, 2013. Moderator: “Cross-Border Investment in Real Estate: Is There Another Bubble Waiting to Pop?” 2013 International Business Transactions Conference & 11th International Litigation and Arbitration Conference, March 1, 2013. Speaker, “Foreign Investment in Key Biscayne Real Estate”Key Biscayne Bar Association, Key Biscayne, Florida, February 5, 2013. Speaker, “International Estate Planning Considerations for Persons with U.S. and Foreign Contacts,”Lorman “New Era of Estate Planning” Seminar, Miami, Florida, April 24, 2012. Gifts of Certain Intangible Property by Foreign Persons – Principles, Pitfalls, and Planning Opportunities, Bloomberg BNA – Tax Management – Estates, Gifts and Trusts Journal – March 8, 2012. The Ever-Elusive Definition of “Intangible Property,” Corporate Business Taxation Monthly – November 2011. Speaker, “Gifts by Foreign Persons to U.S. Taxpayers – Pitfalls and Planning Opportunities,”Transnational Tax Network Seminar, Miami, Florida, May 12, 2011. Speaker, “Gifts by Foreign Persons to U.S. Taxpayers – Pitfalls and Planning Opportunities,”Florida Bar New Tax Lawyers, Miami, Florida, April 27, 2011. Speaker, “Some Perceptions on the Domicile of Aliens with U.S. Contacts,”Greater Miami Tax Institute, Miami, Florida, November 10, 2010.